Which is the Best Hybrid Table Saw for You? Hybrid table saws are the latest and greatest thing on the saw market right now. They’re a new format that’s somewhere in between a contractor table saw and a cabinet-style unit. The idea is that they’ll give you the precision, power, and steadiness of a cabinet unit in a portable package like a contractor saw. We think they’re a great compromise option for DIYers who dream of a cabinet unit but can’t quite make the budget work, or professionals who demand cabinet-level precision on the go. However, like a lot of crossover tools, some models capture the best qualities of each format, and some simply fall flat. You’ll need to sift through lots of different formats, too. Hybrid table saws are an emerging category, so there’s a big range of formats and designs available right now. We’ve been checking out all the latest hybrid options, and we put our researchers to the task of choosing the three best ones available now. We looked at every aspect of all the hybrid saws we could find: weight, power, precision, and reliability. We’ve tried to find the best all-around units which tick each of those four boxes. In the end, we’ve chosen three innovative options which we think are worth your attention. Below, you’ll find our in-depth reviews of each model, along with a handy guide to shopping for hybrid table saws. This Shop Fox is our top budget recommendation for a hybrid table saw. It has an enclosed upper cabinet and open legs, for the best compromise between a cabinet and contractor saw. We think this is one of the most versatile hybrid units out there, since it can be rigged for either 120 or 240V, and it comes mounted on wheels for added travel-readiness. This is a great, inexpensive step up from a contractor saw for people looking for the most movable hybrid. It’s powerful, thanks to a 2 HP motor. That’s at least as powerful as most contractor models, and it’s as powerful as many entry-level cabinet units. It can provide up to 3450 RPM blade speeds, which comparable to most smaller cabinet saws. Reviewers said it worked excellently on both hardwoods and softwoods. The half-cabinet design gives you an enclosure that protects moving parts and aids dust collection without adding as much weight as a full cabinet. We like it because unlike many hybrids, it really is like a cabinet with the bottom cut out. It’s completely sealed, and built just as sturdily as the cabinet units–only without all that extra metal at the bottom. This one also has a steel motor cover, and convenient rear panels for performing maintenance on the internals. It feels a lot like a cabinet unit when you’re working. This one has a solid cast-iron worktop, and sturdy steel wing extensions. The trunnions supporting the motor are solid cast iron for noise and vibration dampening, and they’re mounted to the cabinet, not the worktop–taking an element of a cabinet saw over a contractor unit, which usually have the trunnions mounted to the worktop. With a 40-1/4″ x 27” you don’t feel quite as limited as you might on a contractor saw, either. Overall, it’s a big, solid workstation that really does feel like a cabinet in the field. This one also has the sort of guard system you’d find on one of Shop Fox’s full cabinet units. It’s a quick-change, modular system including anti-kickback pawls and guard panels on both sides of the blade. We think it’s a lot more user-friendly and adaptive than a lot of contractor-class guards we’ve seen. You can choose between the typical splitter attachment and an interchangeable riving knife, for applications where the guard can’t be used. It’s already mounted on casters! Most hybrid table saws are at least compatible with wheeled bases, but you normally have to buy them separately, which can add a couple hundred dollars to the cost of your saw. This one has caster wheels built in. That’s nice because you aren’t adding any height to your saw. Additional bases will tend to jack up the table height a few inches and throw off the ergonomics. We love the riser system on this unit’s casters. You just use the foot pedal to raise the unit, then simply reverse the lever to lower it back down to the ground. It’s easy to move around the worksite or the shop, and we think it’s a bargain on such an inexpensive unit. It has a relatively wide rip capacity for its size, at 30” to the right of the blade, and an extra 15” to the left. That’s enough for most worksite cuts, especially if you don’t normally cut whole sheets of plywood or other flat stock. It has the same sturdy, precise fence design as the cabinet options. There’s a ruler along the fence rail, and the rails themselves are made from sturdy steel. The fence also lifts off for transport–ideal for the traveling woodworker. We also love that you can lock it at either end, perfect for busy job sites with lots of moving parts. Like its larger counterparts, the Shop Fox’s blade can tilt up to 45 degrees for cutting bevels, miters, and chamfers. You can adjust the angle and height of the blade with balanced flywheels, just like on the full cabinet models. It’s much better at dust collection than contractor saws. That’s because it has a fully-enclosed upper cabinet, which doesn’t allow for any leaks in the vacuum system. Plus, the flexible wings on the guard move independently to block dust spray to the side of the cut. That means it’s all channelled into the vacuum system as well. This one has a standard 4” outlet, so you can use it with an industrial/shop-grade dust collection system that can provide 400 CFM or better suction. It can run on either 120 or 240V power. You’ll have to tweak the system for 240V, but it’s a simple matter of redoing the pre-wire configuration. We like dual-voltage motors because they provide a lot of flexibility. You can use 240V wherever you have access to it at a worksite, and rewire to 120V if you know you’re in for a long job at a site without 240V. It’s relatively light, at just under 250 pounds. That’s not a walk in the park, but it’s half the weight of comparable cabinet units. The low weight makes this the most portable hybrid unit here by a long shot. It’s very budget-friendly. As any professional will know, $1000 is a pittance to pay for a table saw with this many sturdy parts and thoughtful features. That makes it an excellent choice for an ardent hobbyist looking for the least expensive upgrade from a contractor model, or for a pro with a tight bottom line. It’s covered by a 2-year warranty. Thanks to available add-on plans, you can cover this one for up to 4 years! Shop Fox also has a quite good reputation for quality control and support. This is a relatively compact unit, so it has a smaller rip capacity and motor than others. If you make a lot of larger cuts, such as on full sheets of plywood, you may want something a bit wider. Since it’s a newer model, it doesn’t have much of a track record for reliability. We weren’t able to find any buyer reviews from folks who had used this unit over an extended period. However, judging by other Shop Fox models, it should be quite good. While Shop Fox don’t list power and speed ratings at each voltage option, it’s usually safe to assume that a “2 HP” motor won’t be quite as powerful at 120V. We’d really recommend using this with 220V power if that’s an option at your worksite. This Shop Fox offers a substantial upgrade in power and speed over our budget recommendation, in nearly as compact a package. It’s a good choice for pros who demand lots of power in as small a footprint as possible. We especially like the cast iron wings on this model, which make for a pretty seamless work surface. It’s the best choice for folks who will be working with their hybrid machine primarily out of their shop. It looks and feels exactly like a cabinet saw, because it is one! It’s just sized down into the contractor size scale, which makes it much easier to take with you when you load into a worksite. This unit has a full steel cabinet, heavy cast flywheels for adjustments, and heavy-duty rails for the fence. Those are all the key features you’d look for in a cabinet unit, and it’s all in a contractor-size package. The extra cabinet space does have a few advantages over the cutaway format: this one has space to hang the adjustment wrenches and zero-clearance throat plate on the back, and space for the miter gauge inside the unit under the motor. The whole thing is powder-coated for extra durability. Even though it’s compact, it provides a very reasonable amount of workspace. This model has a 29 1/2” rip capacity, very nearly as good as the cutaway model. The fence has cam lock adjustments for ease of use, and it has a unique synthetic facing material which makes stock slide along very smoothly. The fence heads also use nylon sliders instead of plastic to make them more durable over extended use. Unlike the cutaway Shop Fox, this solid unit has cast iron wings as well as the precision worktop. The cutaway unit uses steel for its wings, which makes for a split work surface between the worktop and the extensions. This one feels like one seamless table, with a superb evenness across the whole thing. It comes with a miter gauge and corresponding T-slot cut into the worktop. This one also includes an anodized, extended fence stop which matches the larger fence, giving you more of a defined miter angle to work with. It’s the sort of accessory that really comes in handy for the pro. It’s ideal for cutting longer pieces of stock on an angle. The flip stop on the same accessory also comes in handy when you want to cut several angled pieces at the same width. As with the cutaway model, this Shop Fox can tilt up to 45 degrees for making bevel cuts. It’s a lot more powerful than the cutaway Shop Fox. This unit has a 3 HP motor, to start, which gives you 1/3 more power right off the bat. It also has an innovative triple-belt drive system which transfers power to the blade arbor more efficiently. The result is over a 500 RPM speed increase. That’s ideal for folks who cut a lot of hardwoods or composites, which can bog down slower blades. It also makes for faster work times on all your cuts. This one adds a few safety features over the cutaway model. It has a magnetic switch and thermal overload protection, protecting the motor from overheating, as well as from power fluctuations–a serious concern if you’re working off a worksite generator. It also has the same interchangeable guard and riving knife options. The riving knife is a “true” setup, which means that it’s set into the same trunnion as the blade, so it follows the exact height and tilt of your cut. The guard has twin, independent side plates which can move together or alternate, depending on what kind of cut you’re making. It’s compatible with wheeled bases. This one is easy to install on most of Shop Fox’s steel wheel-bases, allowing you to transport it in any truck with a suitable ramp. Previous buyers said it cut nearly dead-on out of the box, and only needed a few minor adjustments. It’s covered by the same 2-year warranty as the cutaway model, and it’s available with the same add-on warranty options as well. It’s a lot heavier than the cutaway Shop Fox. This one weighs a bit over 500 pounds. That means you’ll definitely need to put it on wheels to move it about. It’s also quite a bit less convenient to bring to worksites. However, the extra weight does make for a more precise cut than the cutaway’s steel wings offer. It’s a lot more expensive than the lighter version. This one will cost you about $500 extra, for a unit that’s nearly the same size. That extra cash will get you the cast iron extensions and a sturdier machine, but it won’t give you any improved cutting capacities or other extras. This one only runs on 220V. That’s not a big downside for us, since you’ll need 220V supply to get full use out of the 3 HP motor. However, it does mean you’ll only be able to use it at shops and worksites with 220V feeds. Our top quality recommendation in the hybrid department comes from Powermatic. Format-wise, it looks a lot like the full-cabinet Shop Fox. It has a fully-enclosed cabinet, cast iron extensions, and a quiet, smooth belt-drive system. We love all the smart features and efficient power the company have packed into such a compact unit. It’s our top choice for pros on the go, and especially for passionate home woodworkers who want as much cabinet-grade quality as they can get on 115V. It has a lot of the same features as the enclosed Shop Fox model we’ve just looked at: a full, floor-length cabinet enclosure made of powder-coated steel, a precision cast-iron worktop and extension, and a locking fence on metal rails. This one has cast iron support trunnions, tool storage at the side of the cabinet, and a slippery fence surface to keep your cuts moving smoothly. There’s a standard 4” exhaust port, a T-slot, and miter gauge included. It runs on standard household power (115V) , but still produces 1 3/4 HP. If you’ve got access to 230V power, it can run on that, too(provided you rewire it)! However, we’re very impressed by the fact that this one runs nearly as well on standard voltage as on a shop current. It has half the horsepower as the enclosed Shop Fox, but produces almost the same blade speed! That’s thanks to an innovative belt-drive system. It’s smooth, quiet, and extremely efficient. The lower voltage compatibility makes this an excellent upgrade for passionate home woodworkers. It’s a great choice for folks who dream of a cabinet unit, but can’t justify the cost of installing a 220V hookup for one tool. The molded housing surrounding the blade helps channel dust into the exhaust hose more effectively. Paired with the independent guard panels, this one does the best at removing dust of our three recommendations. It has a wider miter capacity than the Shop Fox units. The included miter gauge rotates up to 60 degrees in each direction, which makes this one the best choice for wide-angle cuts. Its twisting cam-lock handle makes for very repeatable angle cuts. Blade adjustments for height and bevel changes are simple and precise thanks to heavy-cast wheels, like you’d find on the Shop Fox units. We prefer the Powermatic’s wheels since they have locking central knobs to keep your adjustments in place should you brush against the wheel as you cut. The wheels and caps are all metal, so they’ll work for the life of your machine. They’re also slightly oversized, at 7 inches in diameter, which makes adjustments quicker. As with the Shop Fox units, the Powermatic’s guard and riving knife system is modular and user-friendly. The guard has dual panels which move independently, to keep dust from shooting off the side of the blade. You won’t need any tools to change the riving knife or splitter guard, which makes the whole thing extremely convenient. They’re also mounted in the same truss as the blade, so they’ll always line up properly, no matter what height or angle adjustments you make. The power switch is our favorite safety feature on this unit. It’s a newly updated design from Powermatic, and it’s one of our favorites on the market right now. The power button itself is extra-large, red, and soft, which makes it extremely easy to press, even when your hands are free and you have to use a leg or hip. You press the button to turn power off, and pull it out to turn power off. It’s a simple design tweak which makes it much harder to accidentally turn the motor on, and much easier to switch it off quickly. There’s also a locking key which sits in the button while you’re not using the saw, to make absolutely sure it doesn’t come on without you wanting it to. It’s easier to service than the Shop Fox’s. This one has a hinged motor cover which hangs outside the cabinet, like a full-size cabinet model. It’s a lot easier to access than the bolted panels you’ll find on our other recommendations. It also has a quick-release arbor lock, which makes one-handed blade changes possible. It’s lighter than the full-cabinet Shop Fox. This one weighs well under 400 pounds, which makes it more maneuverable for portable applications. It’s compatible with Powermatic’s wheeled bases. Overall, previous buyers said they were extremely impressed by the quality of the Powermatic’s parts, construction, and quality control. They complimented the easy blade changes, the modular guard system, and the dust collection in particular. It’s covered by a 5-year warranty. That’s the best of the bunch, and Powermatic have very good customer service. Previous buyers said that the company were very helpful in getting them started and providing replacement parts where necessary. It’s pretty expensive. One of the reasons we love hybrids is that they’re usually cheaper than a cabinet model. This Powermatic, though, costs as much as an entry-level full-size cabinet unit. For the price, it doesn’t provide a lot of extra rip capacity. This one has a 30-inch capacity, which is about on par with our other recommendations. It’s probably not a great idea for people who need to rip a lot of very wide stock. We’re extremely impressed with the Powermatic’s blade speed and cutting performance, especially considering how small its motor is compared to the Shop Fox models. It’s efficient and effective. With that said, it might not be the best choice for thicker hardwood stock. We didn’t find any complaints about it bogging down, but we’d advise that unless you’re running this one on 230V, you should probably avoid thick hardwoods. The semi-enclosed Shop Fox is the most portable of the three saws, so it’s our recommendation to folks who need something they can travel with regularly. It’s about half the weight of the fully-enclosed Shop Fox, and it’s a good 100 pounds lighter than the Powermatic. It has flexible voltage options, a wide rip capacity, and very reasonable power thanks to the 2 HP motor. On the downside, it has steel extensions which aren’t quite as good as the cast-iron extensions on the other two. It’s also a bit less well-equipped than the other two. We think it makes for a traveling pro’s ideal portable unit. The fully-enclosed Shop Fox is the best option for people who want the power and precision of a cabinet unit, but can’t quite make the price or footprint work within their constraints. It’s the heaviest of the three, so it’s not a great choice for moving around frequently. However, it provides a very impressive amount of power for its footprint, and the cast iron extensions offer precision far above its price tag. We recommend it to people who are looking to use a hybrid table saw in a primarily stationary setting. Just be aware that you’ll need an industrial hookup. The Powermatic is a our top overall quality choice, thanks to its extremely efficient, quiet, and smooth drive system. It cuts the smoothest of the three, with a speed that’s surprisingly high for its smaller motor. It’s outfitted with some great safety features, and it has extremely high build quality on all its parts. Essentially, it’s a super compact and efficient cabinet unit in a contractor saw’s footprint. This is a fantastic choice for people who work primarily out of shops, but want to be able to bring their cabinet unit on the go with them. While one Shop Fox excels on the go and the other excels in the shop, the Powermatic works very well just about anywhere. You’ll want to plan on buying a wheeled base, though, and making sure you have the budget for both the base and the saw, which is on the more expensive end of the spectrum. 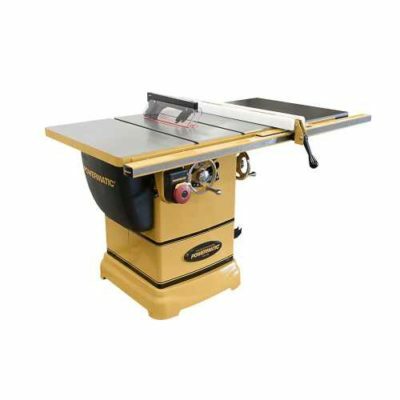 Hybrid table saws generally cost between $1,000 and $2,000. They’re priced squarely in between contractor table saws and cabinet table saws. One of the big selling points of these models is the fact that they allow you to get the sturdy build quality and added precision of a cabinet model without as high a price tag. When you’re comparing hybrid models, you should know that these can vary widely in format, so pricing isn’t always consistent. For instance, a cutaway model with 2 HP motor might be cheaper than a fully-enclosed model with a 1.5 HP motor. In general, though, you’ll pay more for a more powerful motor, for a model with more precise worktop, for cast iron/precision extensions, and for more innovative and efficient designs which allow for more power and precision in a smaller package. More expensive hybrids will usually include better, more user-friendly safety features, like modular guard assemblies and jumbo-sized power buttons. We recommend that home woodworkers aim to spend closer to the $1,000 mark, while professionals will be better able to get their money’s worth out of a premium $2,000 model. It goes without saying that a lighter saw is always easier to move around. If you’re going to need to physically lift your saw, rather than rolling it, you should look for something under 250 pounds. In terms of hybrid saws, that almost certainly means something with a cutaway cabinet enclosure, and steel or aluminum extension wings to cut down on weight. Even so, lifting a hybrid saw is only practical for folks who work with a team on a regular basis. The most convenient solution, especially for hybrid models which weigh over 250 pounds, is to look for a hybrid model that can be set up on wheels. You can take one of several approaches here: there are hybrid models with caster wheels/lift pedals onboard, or you can buy a hybrid model that’s compatible with an additional wheeled base. Most often, you’ll find wheels pre-installed on the lighter cutaway versions, while heavier cabinet-style hybrids will need to be paired with a wheeled base. However, even the best wheeled base won’t entirely solve your weight problem. If you’re moving your hybrid around regularly, you should try to keep weight below 350 pounds or so, to minimize safety risks as well as grunt work. The whole point of a hybrid saw is to get cabinet-grade quality in a lower priced package. You should expect a precision-ground, cast-iron worktop, as well as a solid cast iron trunnion system to support the motor. Look for the trunnions to be attached to the cabinet frame instead of the worktop. That’s a key feature of cabinet table saws which reduces vibration and makes for more precise cuts. Contractor saws, on the other hand, use trunnions attached to the worktop, which is less good for precision. For the cabinet and frame of your hybrid table saw, expect steel, preferably with powder coating on the paintwork to help the whole thing stand up to wear and tear. All good hybrid units tick those basic boxes. The extension wings of your saw are where you’ll see the most variation. The least expensive choices have aluminum extensions, which have their benefits. They’re cheap, and they’re a lot lighter to carry around than cast iron or steel. However, they tend to be less precise, and they don’t sit as smoothly as heavier materials. If you can deal with the extra weight, you’ll want to look for steel, or preferably cast iron extensions. They’ll give you better precision, and a more seamless workspace. On the downside, they’re heavier on both your back and your budget. Overall, hybrid models should feel every bit as premium as cabinet models. Pay attention to all the fittings, and expect very high build quality on everything from the flywheels to the throat plate. Just as hybrid models should have the rock-solid construction quality of a cabinet unit, you can expect them to have lots of brute power onboard. You’ll want to look for motors with at least 1.5 HP, so that you can cut hardwoods without having any problems with lag or motor burnout. You should also check whether the HP rating on a given model is rated for standard 110-120V power, or on an industrial 220-240V hookup. In general, you can expect any motor to perform stronger on a higher voltage. However, some recent hybrids are specifically designed to crank out lots of power on household electricity. If you’re planning to use household power, do check that the HP rating still applies. In addition to saving you money, a hybrid table saw should save space and weight over a traditional cabinet unit. The most common variations on this design are models with cutout legs beneath the cabinet (a bit like a contractor saw), or units with full cabinet enclosures that are sized down from the usual cabinet format. If you’re concerned about lots of weight, you should choose something with open legs and a half-cabinet enclosure. If you’re concerned about space, we think it’s a better choice to buy something with a full cabinet enclosure, since you can use that extra cabinet space as a storage area, which maximizes the saw’s footprint. Before you shop for any saw, you should know exactly what kinds of tasks you’ll be using it for, and what they demand from the tool in terms of power, size, and durability. First, think about how often you’ll use your hybrid saw. If you’re only an occasional woodworker or home hobbyist, you probably don’t need something quite as industrial as someone who makes a living as a carpenter or contractor. If you’re a full-time woodworker, it’s worth your money to spend more up front for a unit that can handle all-day, everyday use. The more you pay, the better your hybrid table saw will generally stand up to wear and tear over the long term. Next, consider the types of stock you’ll be cutting. If you’re going to be working with lots of hardwoods, or with thicker softwood stock, be sure to opt for a more powerful hybrid unit with a higher max blade speed, and a motor with either 2 or 3 HP. If you’re working mainly with softwoods or thinner hardwoods, you can probably get away with anything above 1 1/2 HP, provided the saw has a high enough RPM. Remember that most models list power ratings as tested at 220V industrial power, so be sure to be conservative with power ratings if you’re working with normal/110V power. Then, start thinking about the specific cuts you need to make. If you work with a lot of wider angles, pay close attention to the miter and bevel capacity on your new unit. Look for at least 45-degree angle capacity for both types of cut, preferably more if you’re a professional or ambitious DIYer. Likewise, think of the widest rips you have to make on a regular basis, and make sure your hybrid table saw has a rip capacity that can accommodate those widths. Most professional shops and worksites will be able to supply 220-240V industrial power, which allows you to get the most out of your saw. All hybrid units will run on an industrial hookup, so if you’ve gone one available, you don’t need to worry about compatibility. However, most home woodworkers don’t have access to that kind of hookup, since it’s so expensive to install. That’s why most hybrids are designed to work on 110-120V power as well as industrial hookups: they’re designed to be an easy way for the home DIYer to experience the power and precision of a cabinet model without having to rewire. If you’re using standard power, be sure to check your new saw before pulling the trigger, so you can be positive it’ll work for your needs. You’ll also want to make sure the power and speed ratings apply at that lower voltage, to make sure you’ll actually experience the saw’s full potential. Where possible, look for dual-voltage motors that can be rewired easily depending on your power options. If you’re still not sure whether a hybrid table saw is your best bet, you can compare our recommendations to the rest of the competition here on Amazon or read our Best Table Saws reviews! You can also find the top miter saws in the market on our homepage!